Stock trading volume is important technical analysis indicator that I use a lot in my personal strategies used in trades on US exchanges. 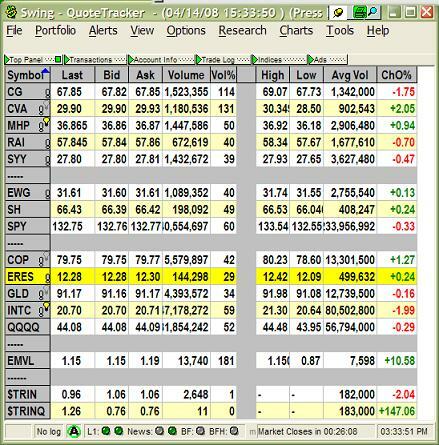 I like to see strong stock market volume for any symbol when I am entering my online trades. When I see strong stock trading volume for a particular shares in my watchlist, I’m more confident about entering trade. The market trades that are executed when volume for specific shares symbol is above average value are trades that make biggest profits. How do I know it ? I have found this interesting information in my personal history of online trading that I store in my trade journal software. I found that it is very useful to have all my trades I have executed written in my trade journal. This personal history of online trading I use for different reports and searches that often help me to find problems and to improve results of my position and swing trades. 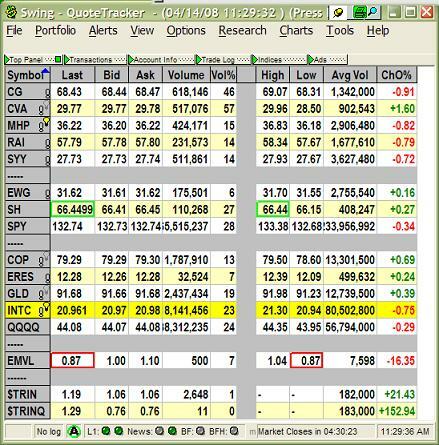 I use quite simple technique that use the free trade and analysis software MedvedTrader (Quotetracker) for monitoring interesting shares during a trading day. Here’s basic info about this setup. The most important column I monitor is Vol%. What I like to see is that the ticker must present bigger volume than most of the other stocks in my watchlist. It’s also very good to compare every ticker with a current volume value of QQQQ shares. This ETF is a heavily traded instrument. So if I can see shares with a current % volume near the current QQQQ stock trading volume % or above this value, I prepare for action or start to monitor such market ticker much more closely. Here is one example describing simple techniques for monitoring of share price volume levels for tickers you want to trade. 1. Watchlist after the first trading hour; please notice as CG and CVA stocks are already trading above the QQQQ shares volume level. Both stocks are near 50% of average trading volume after 2 trading hours already. They signalize something is happening with them. 3. And finally, before the close of the markets. Abnormal stock volume levels are confirmed for CG and CVA stocks. 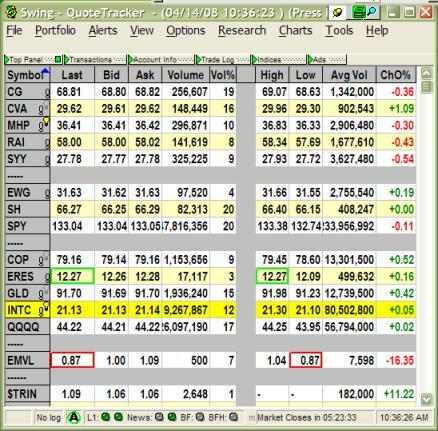 Quotetracker is quite good piece of software for these purposes. But there is possible to use also alternative source. 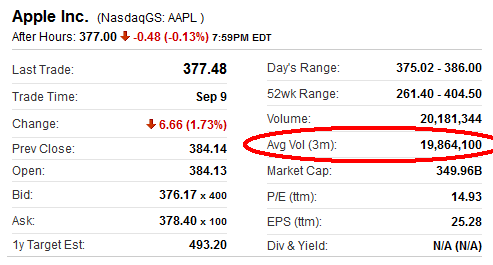 First there is necessary to find average volume for monitored share ticker. It is possible to check Yahoo finance site to obtain this info. Here is example for AAPL shares. The same data must be obtained also for QQQ as reference market ticker. These data about average volume level should be put into some spreadsheet and then you can also put there some important levels like 30%,50% and 80% af daily average volume. Then monitor actual shares volume in your broker application and compare it with levels you have written in your spreadsheet. If you find that ticker passed 50% level during first or second trading hour you know that something is happening with these shares.